The summer holidays are here and so is the sun strongly shining down on us. The days are getting hotter, and going out is becoming exhaustive. Vacations mean a lot of outing but if you have no plans for these holidays we have come up with an issue to simply pep up your holidays. Lemon drinks have been the ultimate soothing drink whenever heat takes a beat on us. We have come up with creating new and delightful versions of simple lemon drinks that will make ensure a change from simple lemonades. 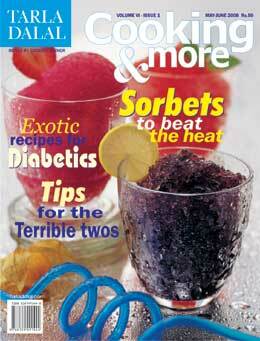 The highlight of this issue is the release of our book on exotic recipes for diabetes that ensures that people with diabetes can also dig into the multi cuisine dishes from delicious soups to mouthwatering desserts all made to suit you. This summer get a cue about organic foods and their benefits with delicious recipes from the mountains. Dr. Nirmala Shetty provides the magical ingredients to ensure you take adequate car of yourself. Walking becomes healthier this summer as we show you ways to avoid problems related to walking this summer.